Those are some impressive stats indeed, but we are now about to test if they translate to actually great real-life performance. The wait is over, all the tests are run and the results are in. Our first test measures the phone’s endurance on 3G talks. The HTC One Max did great, very close to the official rating of 25 hours and notably better than what its fiercest market rival, the Galaxy Note 3, managed. 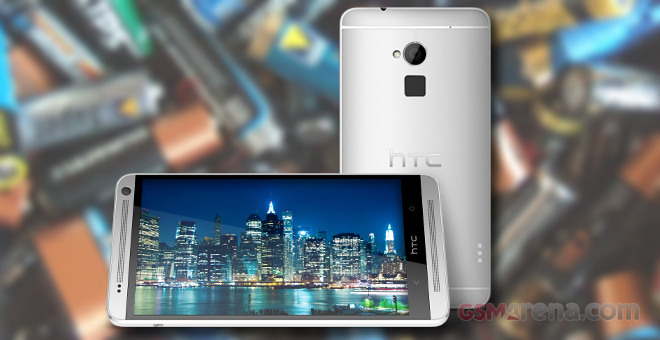 Web browsing came in next and the HTC One Max delivered another stellar performance. It went on a web browsing loop for 11 hours and 20 minutes and once again comfortably outlasted the Galaxy Note 3.. The One Max didn’t disappoint on our video playback test either. It lasted 13 hours and 11 minutes and while that wasn’t enough to top the Galaxy Note 3, it’s not too far behind either. Finally HTC One Max turned out to be great when it comes to stand-by efficiency too. That’s why its final endurance rating is among the best we’ve encountered until now. 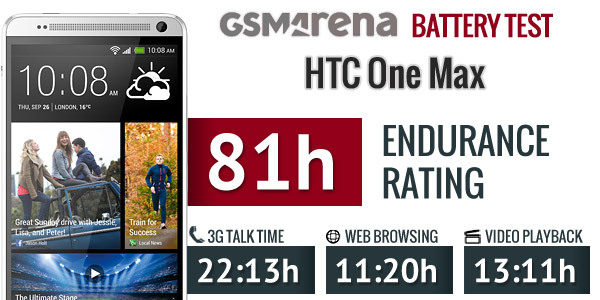 A rating of 81 hours means that the HTC One Max will last almost three and a half days if you used it for one hour of video playback, one hour of 3G talks and one hour of web browsing each day.